By the time Fitbit decided to make a smartwatch, it was already behind. It was 2014, and Apple had already announced its watch at its annual fall event. Android Wear was on its way to building up an ecosystem of watches, and Pebble had been around for years. Fitbit, meanwhile, was still busy cranking out generation after generation of simple fitness trackers you could slap on your wrist. 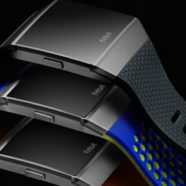 Every year, the company loaded its gadgets with incremental improvements—automatic heart rate detection, slimmer bands, continuous activity tracking, and oxygen consumption monitoring, to name a few—so that when it launched the Blaze in 2015, many viewed the angular wristband with a full color screen as the Fitbit’s first smartwatch. “We didn’t say it was a smartwatch, but a lot of people perceived that it was,” says James Park, Fitbit’s co-founder and CEO. It wasn’t—at least not compared to Fitbit’s newest product, the Ionic, which comes out in October. The $300 gadget does plenty of the things people expect from a smartwatch: It plays music, supports mobile payments, displays push notifications. Just don’t call it a wrist computer. The Ionic still feels like a hybrid of the Apple Watch, with its Swiss army knife functionality, and the minimalist fitness trackers that have become synonymous with Fitbit. After years of watching companies struggle to find the smartwatch’s raison d’etre, Park realized that Fitbit’s device needed to be laser focused. “What we’d been seeing in the marketplace were devices where the technology was really looking for a problem to solve,” he says. “Consumers were just confused and unclear about what the purpose of a smartwatch was when it first launched.” Fitness and health, they decided, was the killer app. And so the company set out to create a smartwatch that was a fitness tracker first, traditional smartwatch second. Like most Fitbit products, the Ionic has a utilitarian look. A small rectangular display sits inside the square watch face, like a mini writst television. The angular body, made from nano-molded aluminum, slants downward from the face in an octagonal shape, before connecting with the plastic strap. “We call it geo-organic,” says Jonah Becker, head of design at Fitbit. Becker and his team drew inspiration from martian landscapes, sci-fi movies, and technical athleisure in order to give the Ionic its futuristic feel. “There’s a lot of stuff that’s kind of looking backwards in terms of trying to make a smartwatch feel like the same watch your dad had 30 years ago,” he says. “It felt like it was playing it very safe.” The Ionic’s design, while not exactly elegant, doesn’t feel like a brute exercise tool either. It’s meant to be worn all day and night. And with four-plus days of battery life (10 hours if you’re using GPS and streaming music), that’s actually possible. The battery is layered inside the watch’s body, along with an accelerometer and antennas for GPS, Bluetooth, and NFC, which enables mobile payments. On the underside of the watch, a series of optical sensors help the gadget keep track of your heart rate. “This is a tri-wavelength sensor,” says Shelten Yuen, head of Fitbit research, pointing to the LED in center of the watch. Most Fitbit products use a tool called PurePulse, which tracks heart rate by shining green light onto the top of the wrist. Because blood absorbs green light, photodiodes on the underside of the watch can monitor how much light is being absorbed at any given time. Every time your heart beats, there’s an uptick in green light absorption, which allows the gadget to infer your heart rate. The tri-wavelength sensor, which can distinguish between red, green, and infrared wavelengths, allows the device to gather more fine grained information like relative blood oxygen level. Using this information, Fitbit is able to keep track of breathing habits, which could in the future help diagnose conditions like sleep apnea. “I think of this as the next wave of biomedical engineering,” Yuen says. Those same sensors will be available to third party developers who want to build apps using the data gathered from the Ionic. Fitbit is launching the Ionic with four main partner apps—Pandora streaming, AccuWeather, Starbucks mobile payments, and a Strava activity tracking—but they’re opening the ecosystem this fall so any developer can add to what the company calls the app gallery. Though Fitbit thinks of the Ionic as a fitness accessory, customers will inevitably compare it to more established smartwatch brands. And at $300, they should. Fitbit wants to distinguish itself from the bigger ecosystem of smartwatches, and with some smart health initiatives in the works, it just might—eventually. But for now, the Ionic might not want to call itself a smartwatch, but that’s exactly what it is.